Location: Spain is located on the Iberian Peninsula in Western Europe. It has borders with Gibraltar, France, Andorra and Portugal. Before it was conquered by the Romans, Iberia (Spain) was populated by Celts, Iberians and Basques. It was also conquered by Moorish invaders from North Africa. The last Moorish Kingdom in Spain lasted until 1492. Spain was the most powerful country in Europe for all of the 16th century and for a large part of the 17th century. The Spanish Empire was massive and included territory in North and South America, parts of Italy and lands in modern-day France, Germany, Luxembourg and the Netherlands. This period of history is often referred to as the Spanish Golden Age. The Spanish Civil War was fought between 1936 and 1939, between Nationalist forces (led by General Franco – with the support of Germany and Italy) and the Republicans (supported by the Soviet Union). Over half a million people died during the fighting. The Balearic Islands (Majorca, Ibizia, Minorca and Formentera) and the Canary Islands (including Fuerteventura, Gran Canaria, Lanzarote, Tenerife and La Palma) are part of the Kingdom of Spain. Mount Teide, a volcano on the island of Tenerife, is the highest point in the Kingdom of Spain. It is 3718 metres high. Spain has a massive toursit industry, worth more than 40 billion Euros. Some of the largest cities in Spain are: Madrid (the capital), Barcelona, Valencia, Seville, Zaragoza and Malaga. Miguel de Cervantes, the author of Don Quixote was Spanish. Spain is known for its paella (a rice-based seafood dish), gazpacho (a cold soup), Spanish ham, Manchego cheese, chorizo sausage and tapas (a range of appetizers). Sport is very important in Spain, and football (soccer), basketball, Formula 1, tennis, golf and cycling are very popular. Many sportsmen and sportswomen have come from Spain, including: Alberto Contador (cycling), Pau Gasol, Marc Gasol, Ricky Rubio (basketball), Xavi Hernandez, Andres Iniesta (football), Rafael Nadal, David Ferrer, Arantxa Sanchez Vicario (tennis), and Fernando Alonso (Formula One). Chupa Chup candy lollies were invented in Spain. The actress Penelope Cruz is Spanish, as is the actor Antonio Banderas. 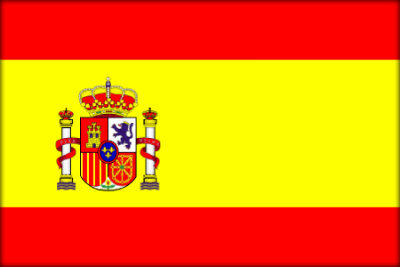 Spanish is spoken in more than 40 countries. Bullfighting is still really popular in Spain. Spain produces nearly half of the world’s olive oil. La Tomatina (the Tomato Festival) is held in Bunol, near Valencia, in August. People throw tomatoes at each other. Famous Spanish artists include, Pablo Picasso, Salvador Dali, Francisco de Goya and Joan Miro. The architect Antoni Gaudi was Spanish and his designs can be seen all over Barcelona.